Some people see golf as more of a game than a sport. True, it doesn’t involve teams of people running up and down a field trying to pummel each other, but it does require excellent, whole body physical conditioning that can truly be called athletic. The goal of the golf swing is to strike the ball in order to achieve maximum distance with a high level of accuracy. There is a kinesthetic sequence that will allow an efficient and effective golf swing. All great golf strikers have an identical sequence of generating speed and transferring energy through the kinetic chain. Each segment of the body builds upon the previous segment: lower body — torso — lead arm. The six phases of the golf swing are: set up, backswing, transition, downswing, impact, and follow through. The set up position is an athletic address of the ball. Proper balance and grip will lead to consistent swing. Improper set up will lead to re-routing of the club, poor sequencing, and swing faults. Poor mobility and poor stability are common traits for a bad set up. Back Swing is when you meet the club in the correct position. During the back swing , the body begins to recruit energy that will be released starting from the top of the action. Some joints will rotate, while some will remain stable. The motion creates torque and stores energy in the muscles to be released at impact. Difficulty in the back swing is also commonly caused by mobility and stability issues. Transition is when you begin the forward movement. Your weight shifts from the inside right foot to the inside of the left foot. The lower body moves first and the torso uncoils. This requires a high level of flexibility, balance, and strength. In the downswing, the weight shift continues generating torque and the power is transferred from lower body, through the body and into the club. The torque is generated by the lower body–glutes, legs, and core. The downswing is complete when impact occurs with the golf ball. A golfer lacking physical strength, power, or flexibility will struggle to develop the speed to transfer the stored energy during this phase. Impact is where the energy created by the body is transferred into the golf ball. The purpose of impact is to hit the ball in the correct direction. During impact, 80-90% of the golfer’s weight is supported by the left foot. The release of hands with correct timing will transfer the power to the club head. You must shift weight correctly to sequence the transfer of energy. Physical limitations such as poor mechanics and improper equipment affect impact. 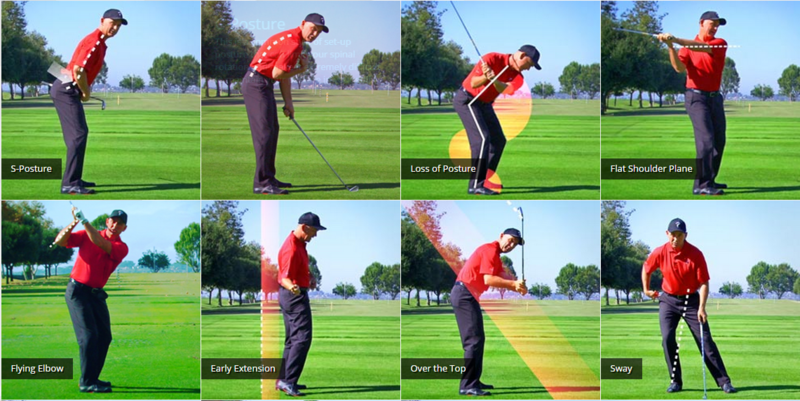 Lack of power at impact will show up in poor distance and direction of the ball’s flight. Follow through is essential to the deceleration of the body after contact with the ball. Follow through is complete when the body has rotated and the club head is behind the golfer. It requires high levels of flexibility, balance, and strength within the kinetic chain. All of the fitness traits the golf swing requires are also essential to your quality of life. As a Titleist Performance Institute certified golf fitness professional, I have expertise in how to train people to reach their optimum levels of stability, balance, and strength to achieve their goals on the course and off. Good, Bad, and What can we do about them? It goes without saying that long winters and tough times can be stressful, but our bodies and minds are subject to stress even in joyful times. We need to take time to be mindful of those stresses and learn ways of coping with them before they catch up with us and impact our health for the worse. Physical Stress: Adequate movement and exercise helps maintain metabolic rate. Correct posture influences breathing, muscle function, joint health,circulation and internal organ support. 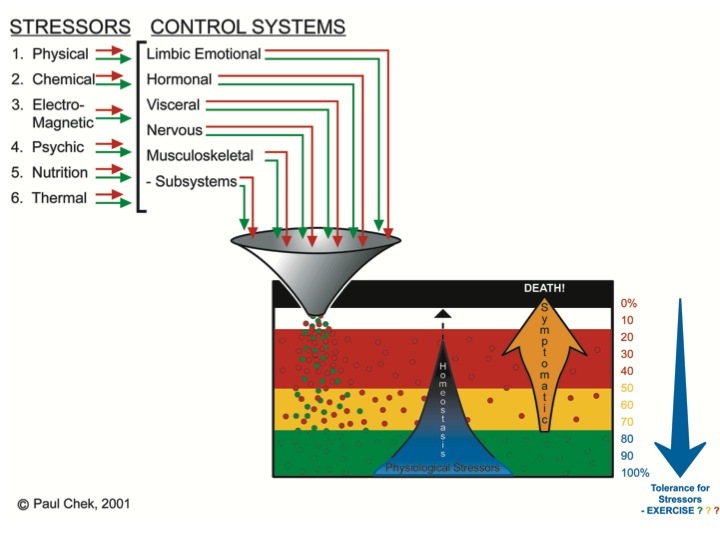 Chemical Stress: Our body naturally produces chemicals that are essential for health. For example when the sun hits the skin it produces vitamin D and regulates melatonin and cortisol. Synthetic chemicals including pesticides, herbicides, fungicides, and fertilizers: the body does not have a mechanism to neutralize them. Choosing to eat organic foods and using non-toxic cleaning products will help to avoid exposure to such chemicals. Electromagnetic Stress: Too much sunlight, medical x-rays, computers, cell phones, microwave ovens, electric blankets, and proximity to power stations all create magnetic stress. Excessive magnetic stress causes dysfunction to the hormonal and nervous system. Be aware of your surroundings. Psychic or Mental Stress: Taking on more work or responsibility than you can manage, being rushed, taking verbal or emotional abuse from others are some examples of negative mental stress. Positive mental stress includes using your mind productively, asking your brain good questions etc. Be conscious of your thoughts and try relieving stress with meditation, yoga, tai chi etc. Nutritional Stress: Not eating or eating too much. Chewing your food less than 20-40 times before swallowing. Drinking water dilutes your stomach acid. Choose organic foods, eat more water-rich foods. Thermal Stress: Try to maintain your body temperature near 98.6 degrees Fahrenheit and avoid being cold or hot for an extended period of time. Stress is linked to all sorts of health ailments, and it impacts the quality of our lives even before we notice that our blood pressure is elevated and our joints are sore. Take a few minutes every day to think about what’s going on in and around your body and take action to care for yourself. Be well, drink lots of water. 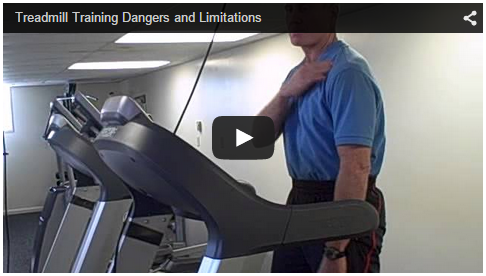 Check out my video on the dangers of treadmills! Strength Training: Not just for men. I was recently approached to answer a question about why women should do weight and strength training. Physical fitness is important for everyone, but unfortunately some people hold on to the myth that strength training is just for bulky gym rats. Nothing could be further from the truth. Below, I included the questions I was asked, along with my responses. Q. Many women are turned off to weight lifting because they think it will make them look “bulky”, what would you say to a woman who uses this as an excuse not to incorporate weightlifting/ strength training in their exercise routine? A. Weight lifting will not make you bulky unless you take steroids and work out six hours a day. Q. Can you explain the metabolic advantages of building muscle? A. Muscle burns 20 times as many calories per hour as fat. Having more muscle will burn more calories even while you sleep. Q. What are some of the best benefits of weight lifting,particularly for women? A. Strengthens the bones, decreases risk of injury, improves performance with everyday activities, from carrying groceries to carrying laundry to carrying your kids. Q. Physiologically, what happens when someone only does cardiovascular exercise and entirely neglects any type of strength training? A. Repetitive stress on the joints and muscles, which will increase your risk of back pain, knee injuries, and ankle injuries. Q. What advice would you give to a woman who wants to start weight lifting but doesn’t know how or where to start? A. Contact a fitness professional with at least ten years� experience. Q.If you didn’t already address this topic in a previous question, can you talk a little bit about the benefits of weightlifting for women in terms of preventing age-related issues suchas osteoporosis? A.Strength training reduces your risk of needing medications, boosts energy and vitality, and maintains weight control. Q.In your opinion, what’s the number one reason women should incorporate weight lifting in their workout routines? A.The number one reason to take up strength training is to avoid your doctor telling you that you are frail and that you have a disability from inactivity.